This is the first page of a web comic I'm doing with what seems about every artist in the northern tip of Kentucky. Honestly every time I talk to my friends, they have someone new wrangled in to doing a chapter for this. I'm not complaining, I think its great. This is just page one of six that I'm doing. I'm actually finished with all the pages, but just posting one. When the sites up, you'll have to go and check out the rest yourself. 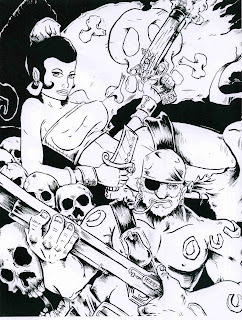 This is a pin up based on some characters created from Mike Maydak, artist of The Blackbeard Legacy . 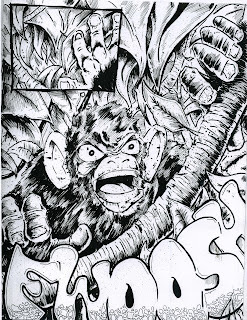 Mike has one of the sickest styles I've seen in comics in a good while. His books are really worth checking out. 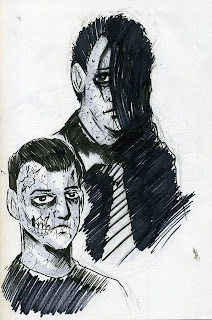 Heres is some preliminary sketches for the band members of The Reanimated. 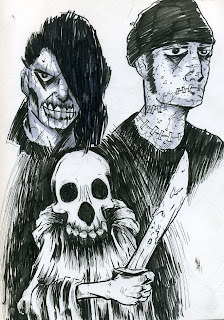 I just finished their album cover.